Not too many giant stars have been found with a planet. 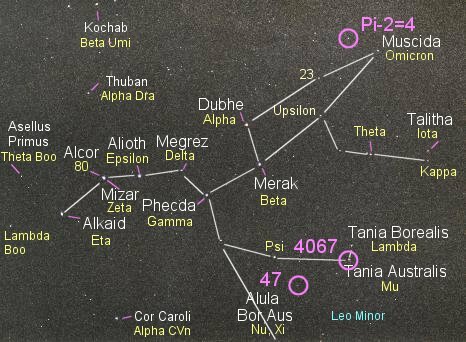 The best known are Pollux (Beta Geminorum) and Ain (Epsilon Tauri). Here's another one. The circle at upper right identifies the class K1 giant Pi-2 Ursae Majoris in the constellation Ursa Major. Pi-2 UMa has a massive planet that carries at least 7.1 times the mass of Jupiter. It orbits the star with a period of 269.3 days (0.74 years) at an average distance of 0.87 Astronomical Units (130 million kilometers, 80.8 million miles), about halfway between the orbital sizes of Earth and Venus. A significant eccentricity takes the planet from as far as 2.3 AU from its star to as close as 0.49 AU. Pi-2 Ursae Majoris (also commonly called 4 UMa is a just-barely-fifth magnitude (4.60) class K1 giant in Ursa Major that, having given up core hydrogen fusion, is dying. From a distance of 252 light years, it shines with a high luminosity (for a planet-holding star) of 127 times that of the Sun from a coolish surface at 4415 Kelvin, which tells of a star with a radius 19.3 times that of the Sun, and a mass of roughly double solar (though other sources say 1.2 solar). Unlike most stars with planets, Pi-2 UMa is not rich in metals, but instead is deficient, with just 60 percent the iron content (relative to hydrogen) found in the Sun. From the planet (were there anyone to see it), the star would appear huge, at average glowering with an orange-yellow light 22 times bigger than does the Sun in our sky, or about 10 degrees across, roughly equal to the span between Orion's Belt and Rigel. The circle to the lower left of Pi-2 shows 47 Ursae Majoris, while that at lower right identifies HR 4067 (which lies just down and to the right of Tania Australis), both of which which also support planets.